← Runners? Volunteers? Register Here! 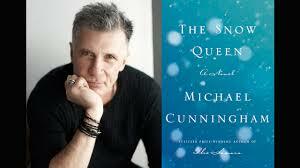 This month’s fiction selection was The Snow Queen by Michael Cunningham. A middle-aged retail worker with boyfriend troubles is walking through Central Park one evening when he notices a mysterious light in the sky. Uncertain what to make of his vision, Barrett returns to the Brooklyn, apartment he shares with his drug-addicted brother and his cancer-stricken wife. In the ensuing pages of this episodic story, the brothers their dreams and delusions. The NYT called The Snow Queen Cunningham’s “most original and emotionally piercing book.” Our Non-fiction selection, Debt: the First 5000 Years by David Graeber, is “a meditation on debt, tribute, gifts, religion and the false history of money (The Observer).” Bloomberg Businessweek called this a “sprawling, erudite, provocative work.” Our Books of the Month are sponsored by the Meredith Village Savings Bank. We used the grant to buy worthy books that we not otherwise be able to acquire.